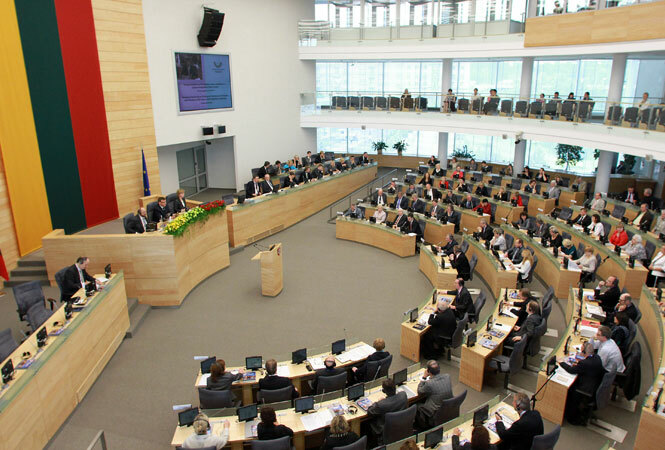 The Seimas, the Lithuania Parliament in Vilnius. VILNIUS, Lithuania — Lithuanian lawmakers on Thursday postponed a final vote on a bill establishing fines for “public family defilement,” a measure similar to Russia’s anti-gay propaganda law. Thirty-nine members of Lithuania’s Parliament (MPs) voted to remove the bill from the parliamentary agenda while 34 MPs voted to retain it, and 20 MPs abstained, reported the daily Lithuania Tribune. The bill defines pride parades, pro-LGBT materials, media or speeches as in conflict with “public morals” and deemed as “public family defilement” punishable with fines up to 3,000 litas ($1,212 USD) for the first offense, and up to 6,000 litas ($2,424 USD) for repeat offenses. Lithuania’s parliamentary conference of chairs called for the vote after it failed (votes were tied) to reach an agreement on a schedule. According to the country’s main LGBT advocacy group, the Lithuanian Gay League (LGL), the vote on the bill is merely postponed, but not dismissed outright. LGL stated that the bill was introduced by MP Petras Gražulis of the Order and Justice Party, in an effort to outlaw the Baltic Pride March for Equality in June. Other Conservative MPs, such as Rimantas Jonas Dagys, signaled they would support the bill if its wording would be toned down. The Order and Justice Party, who form the current Lithuanian government in coalition with the Social Democratic Party, has a history of extreme anti-gay statements and repeated attempts to pass similar anti-LGBT legislation. Robert Biedron, General Rapporteur of the Parliamentary Assembly of the Council of Europe (PACE), has warned that if Lithuania votes the bill into law, it would breach the European Convention on Human Rights, which the country signed as part of a condition of being a member of the European Union.